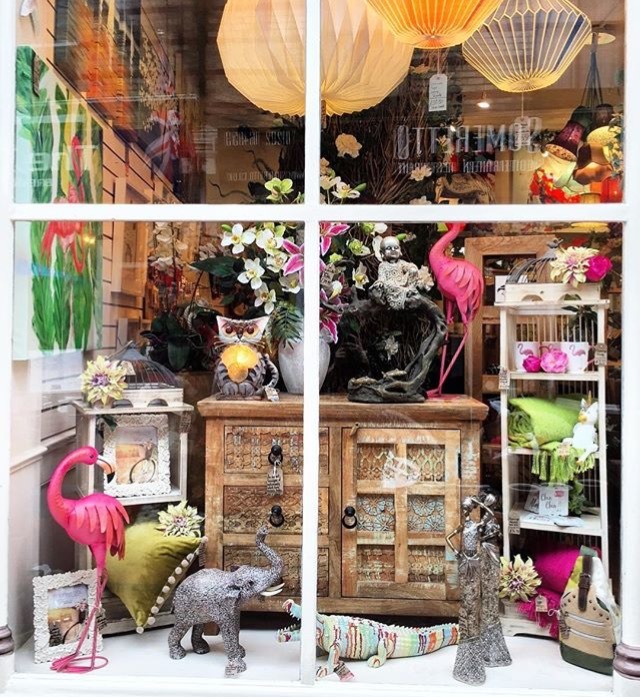 Have you noticed our new lovely flamingo window when you walk past our shop? It is from the hands of our lovely shop fairy Emma. Here are the tips from Emma, on how to dress a lovely window. Discussion of ideas – brainstorm ideas of products that should be featured. This time it was the furniture. It may be based on seasonal items, new items, quantity of stock etc. New Stock – Pick new stock to show in the window. Colour story – Create a colour palette or story so the window creates more of an impact. This time it was based around the flamingo painting, pulling out the pinks, greens and neutrals within the picture. Adding a pink flowers, a blanket, and flamingos and adding a green blanket and cushion. The neutral colours make the greens and pinks pop out. The colour story may depend on the season and who it’s aimed at. It’s spring so lighter colours are better than dark and heavy ones and also this window has a more warm, soft feminine feel. A vague theme – Flowers, flamingos and Spring. Using exotic flamingo products, orchids and the sitting Buddha and mixing it all up with Spring flowers and feminine gift ideas to make it eclectically Scape! Lighting – Lights are important to light up the product and to give life to the window when the shop is closed.